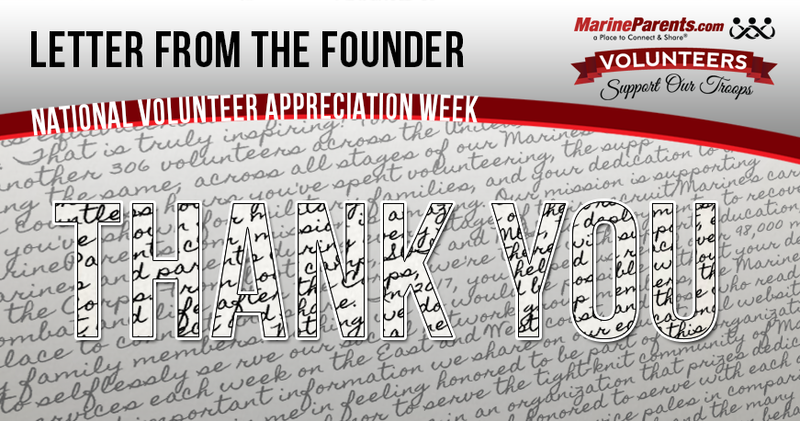 Every year MarineParents.com spends a week in April recognizing and sharing our appreciation of MarineParents.com volunteers with the military families we help through our outreach programs. In 2017, there were 48,611 total volunteer hours dedicated to the organization's mission. That is equivalent to 23 full-time staff members working 40 hours a week. That is truly inspiring! For every hour that you volunteer, there are another 306 volunteers across the United States doing the same; across all stages of our Marines' careers in the Corps. This year, we're sending out 121 individual Presidential Volunteer Service Awards and two team awards. The teams are comprised of 39 individuals. There is a total of 160 Gold, Silver or Bronze PVSA pins being sent out to volunteers this week. The countless hours you've spent volunteering, the support you've shown for military families, and your dedication to the MarineParents.com mission is amazing. Our mission is supporting Marines and parents during every stage of their recruit/Marine's career in the Corps. From boot camp, SOI and MOS, to deployments, to recovering from combat and life after the Corps, we're there with support, education, and a place to connect and share. In 2017 you helped us reach over 98,000 military family members. Nothing we do would be possible without your dedication to selflessly serve our social network group members, the Marines and military personnel who rely on our services each week on the East and West coast, and those who read the vast amount of detailed and important information we share on our educational websites for every stage of the Corps. I know you join me in feeling honored to be part of this organization and the Marine Corps family. It is an honor to serve the tight-knit community of Marine Corps family members. It's an honor to serve in an organization that prizes dedication and commitment to getting the job done right. I feel honored to serve with each of you.